RiverClan is a group of cats that live in a part of the forest that is primarily wetland, or shores of lakes/rivers. The founding leader, River, got his name from moving through the forest like the graceful river, so by extension the name was thought to be given to the Clan. 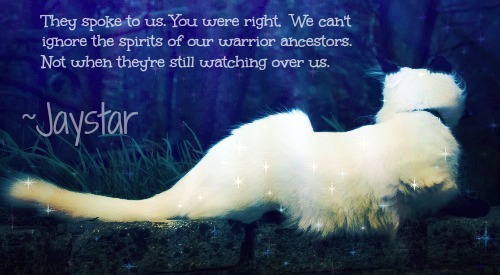 RiverClan is one of the five Clans and consider StarClan to be their warrior ancestors. They live on the reedy, pebbly plain near a river with very few trees. RiverClan cats are known for their amazing skill at fishing and love for water. They also love beautiful things, and are known to collect rocks, shells, and feathers to decorate their dens. They eat mainly fish, but they can also eat water voles, shrews, and mice. They are contented, sleek, well-fed cats with well-groomed fur. They are known to be clever and graceful but are perceived outside their Clan as being stubborn and lazy. Their long fur and glossy coats are an asset while swimming. RiverClan gets by in leaf-bare, because according to other Clans, they fatten themselves on fish during greenleaf in preparation for leaf-bare. RiverClan cats dislike adding birds to their fresh-kill pile. Sometimes other Clan cats call them "fish-faces", or "fish-breath". They are quite strong swimmers and move through the water as if they are part of it. Their lightning reflexes help them scoop fish from the bank. It is revealed that because the RiverClan cats are so well fed and glossy, when they sun themselves on rocks, sometimes Twolegs take them, mistaking them for kittypets. These incidents are kept secret from other Clans.